✅ DOUBLE ROLL wall mounted bath tissue paper dispenser limit those feared and dreaded "out of toilet paper moments " ! ✅ ADD RUSTIC MINIMALIST CHARM with this chic and modern toilet paper holder bound to enhance your restroom decor! ✅ PERSONALIZED touch with 5 country color stains pictured above. ✅ WATER PROOF RUST RESISTANT TP Holder. ✅ HEAVY DUTY iron metal industrial pipes and official commercial fittings. ✅ WALL MOUNTING KIT 4 classic 1" wall anchors. 4 screws we went the extra mile and painted each screw to match your piece measuring 1.6". ✅ This steampunk product arrives FULLY ASSEMBLED. ✅ SIMPLE step by step ILLUSTRATED installation directions included for you to safely mount to your walls. ✅ DIMENSIONS : Product Overall: Length: 9" - Width: 5.5" - Depth from Wall 2" - Height: 10". ✔️ Shelf Alone: Length 9" - Width 5.5" - Board Thickness 1". ✅ We try to utilize reclaimed materials as much as possible to provide unique and authentic products. This means no two pieces of distressed wood are identical because of this shelf dimensions could vary up to 1 inch. ✔️ If this is a concern of yours please contact us prior to ordering and we can send you a customized order with your exact dimensions requested. ✅ Wooden Shelf : Is stained around each side of the wood so it looks great from every angle. ✔️ The shelf is sanded burned then distressed using a variety of techniques that create 3D smooth hollow and curved textures making it appear like reclaimed farmhouse wood. ✔️ Wood is stained to create a weathered look then sealed with a protective finish to treat it. ✅ Pipe Brackets : Pipes fittings & flange receive 2 coats of RUST-OLEUM black semi-gloss indoor/outdoor paint found at your local store. 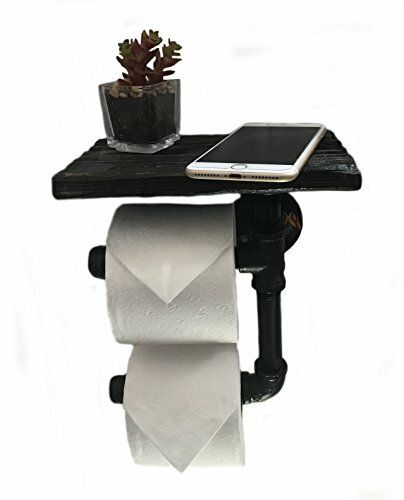 ✔️ MULTI-PURPOSE-Toilet Tissue Holders for home with a vintage looking shelf for easy storage of your cell phone , books , glasses , towels , wet wipes , and other bathroom accessories or decorations . ✔️ DUAL FACED WITH 5 COLOR OPTIONS - The weathered shelves are distressed and stained on all sides to look great from any angle! With 5 primitive color options to choose from. ✔️ HEAVY DUTY COMMERCIAL PIPE- Make your investment last with industrial schedule 40 grade high quality black pipes and fittings that are made out of real heavy iron - not a cheap knock off. ✔️ HANDMADE IN THE USA - It is a toilet paper dispenser not a jig saw puzzle so it comes FULLY ASSEMBLED! If you have any questions about this product by Piping Hot Art Works, contact us by completing and submitting the form below. If you are looking for a specif part number, please include it with your message.